History of the HAGENRING e. V.
The history of the HAGENRING association is closely linked with the city of Hagen. Under the patronage of the industrialist and art-enthusiast Karl Ernst Osthaus Hagen became a centre for an experimental movement in architecture, the “Neues Bauen”. From the beginning of the 20th century until 1921 renowned architects such as Henry van de Velde, Mies van der Rohe, Walter Gropius, Charles Edouard Jeannert (Le Corbusier) and many others supported by Karl Ernst Osthaus were able to realize their innovative architectural projects. They made the town of Hagen a focal point for other artists, sculptors and painters. The unique ensemble of art nouveau houses along the Stirnband road in Hagen were built at that time. After the death of Karl Ernst Osthaus in 1921 and the sale of the Folkwang Museum to Essen in 1922 a cultural vacuum arose. Artists and designers like J. L. M. Lauweriks, Johan Thorn Prikker and Milly Steger left town. To close this gap young Hagen artists founded an informal association – uncommitted to any particular style or school and politically independent – the HAGENRING in 1924. Among the founders were Theo Brün, Reinhard Hilker, August Müller-Lamberty and Karel Niestrath. Honorary member was Christian Rohlfs. In the following years the HAGENRING developed a noteworthy exhibition programme, but from 1933 onwards it became increasingly difficult to withstand the intolerance of the Nazi-Regime. The works of four HAGENRING members Christian Rohlfs, Theo Brün, Karel Niestrath and Wilhelm Nagel were shown in the exhibition „Entartete Kunst“ (Perverse Art) in Munich in 1937. Soon after the war Hagen artists regrouped and in 1946, as part of the festivities connected to the 200th anniversary of the town of Hagen, they showed their first post-war exhibition. Since then the HAGENRING has been represented at home and abroad by many of its members of whom the most famous was Emil Schumacher (1912 – 1999). 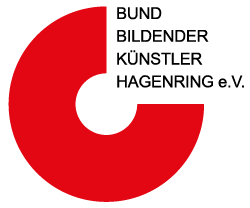 In 2014 the HAGENRING, which is one of the oldest and most active artists’ associations in Germany, celebrated its 90th anniversary.